Back in 2006, when I saw the trailer of Borat: Cultural Learnings of America for Make Benefit Glorious Nation of Kazakhstan I thought it would be a great comedy. Unfortunately, despite all the critical acclaim that movie got, Borat was nothing more than a mediocre film and almost everything funny it had to offer was already present in the trailer. The movie itself was full of bad taste humor which probably only people who have not any actual idea about the world could find entertaining. For the record I didn't like also Sacha Baron Cohen's 2002 film Ali G Indahouse. So, the above were the reasons why I delayed watching the latest film featuring Sacha Baron Cohen, The Dictator. The trailer was not so promising as the one for Borat and the reviews were not nearly as favorable as the ones concerning the 2006's movie. Having in mind my dissatisfaction with Borat I disregarded The Dictator initially. When I finally saw it a few weeks after its release, I was pleasantly surprised. The film was not a masterpiece or even remotely close to greatness but it was quite better than Borat and capable of raising more laughter than Borat without being so nasty. 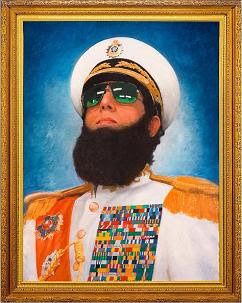 The Dictator is about oppressive and queer North African leader Admiral General Aladeen (Sacha Baron Cohen). Protecting his beloved country Wadiya from democracy is among the despot's highest priorities. Aladeen is in a process of developing nuclear weapons so he has to visit New York in order to address International concerns about his country's nuclear program. But everything goes wrong after it becomes clear he is not the only one wanting to rule Wadiya (watch out for Ben Kingsley). The Dictator shares a lot of similarities with its predecessor Borat, yet not being the first doesn't make it the worse movie. Sacha Baron Cohen's character is coming from a completely different culture again but this time I would guess he has offended less people than in the case with Kazakhstan. In both of the films his character visits America unprepared for the western world and has to deal with numerous complications. But in The Dictator the visit is actually funny while in Borat it's mostly nasty and annoying although this doesn't mean The Dictator is void of a good portion of vulgarity. The story is nothing impressive and it is just a device for the endless string of comical situations. The plot is nearly ridiculous and you will hardly find anything serious in the narrative (even though there is an attempt at a more serious speech towards the end of the film). A few pieces of political satire are thrown in the mix but political correctness is something you won't find in this movie. Nevertheless, the main intention of a comedy is fulfilled cause the fun never stops throughout the whole film. If you are not afraid of R rated humor it is really easy to enjoy The Dictator.